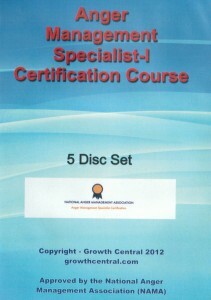 Here are the steps for the 5 disc DVD Certification Courses: (You will receive instructions with the course package. Step 2 – View the BASIC CONTENT TRAINING VIDEO – it is helpful to take some notes. Step 3 – Take the Basic Content Quiz and fax it to the NAMA office. They will send you and email that you have passed and you are ready for the Supervision component. Rich Pfeiffer, MDiv, Ph.D., – Director/Founder Growth Central, author of the Anger Management Workbook and Curriculum as well as eight Real Solution Workbooks and the bestselling Creating Real Relationships. He is a Licensed Marriage and Family Therapist, an Integral Psychotherapist, and a nationally Certified Anger Management Specialist-V. His psychological / spiritual training is the foundation for his expertise in helping people work through their core conflicts. He is a Distinguished Diplomate in the National Anger Management Association (NAMA), a Fellow of the American Association of Pastoral Counselors (AAPC), and works with adults and couples in anger management and integral psychotherapy. Anita Bohensky, PhD – Clinical Director of Growth Central, author of the Anger Management Workbook for Kids & Teens. Dr. Bohensky is a graduate of New York University where she received her Doctor of Philosophy in Developmental Psychology. Her training is extensive having received a Certificate in Psychoanalysis and Psychotherapy from the Postgraduate Center for Mental Health, New York, NY. She is Director of the Whole Child & Adolescent Center, an Assistant Adjunct Professor and Supervisor at Columbia University Teachers College, and a Supervisor at Postgraduate Center for Mental Health. She is a Distinguished Diplomate in the National Anger Management Association (NAMA) and works with children, adolescents, and adults. Security Issues: Online ordering on our state-of-the-art SSL Certified Order Form is guaranteed safe. Growth Central Online Guarantees 100% Satisfaction on all purchases from our secure shopping cart.